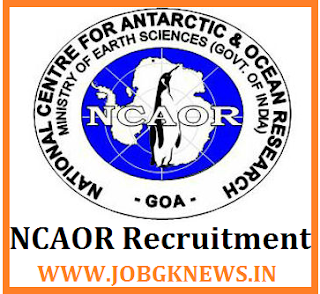 National Centre for Antarctic and Ocean Research (NCAOR) has released a notification for the recruitment of 45 Project Scientists. Interested candidates may check the eligibility criteria and apply online from 29-09-2017 to 21-11-2017. GET FREE ALL INDIA GOVERNMENT & PRIVATE JOBS ALERT ON YOUR WHATSAPP. ADD THIS MOBILE NUMBER (9277772272) ON YOUR WHATSAPP GROUP. Note :- For more Information, visit Detail Advertisement. Educational Qualification :- Candidates should have passed Master’s Degree in relevant subject OR Bachelor’s Degree in Engineering/Technology in relevant subject from a recognised university with 60% marks. Interested and eligible candidates may apply online through NCAOR website - http://www.ncaor.gov.in/ - from 29-09-2017 to 21-11-2017. Click Here For Join Our Whatsapp Group.